Arsenal powered into the last 16 of the Europa League with a comfortable second-leg victory over Bate Borisov at Emirates Stadium. Trailing 1-0 from the first leg, they scored inside four minutes when Pierre-Emerick Aubameyang's cross was turned in by Bate defender Zakhar Volkov. After a disappointing performance in losing the first leg in Belarus, Arsenal needed to score at least twice to go through. Bate were denied an equaliser just four minutes after Arsenal had taken the lead, when Stephan Lichtsteiner slid in to make a goalline clearance from Stanislav Dragun's header. The visitors also went close when Maksim Skavysh hit the side-netting in the first half, but Arsenal had better chances through Alex Iwobi, Xhaka and Aubameyang. The draw for the last 16 takes place on Friday, 22 February at 12:00 GMT, and you can follow it live on the BBC Sport website. Arsenal boss Unai Emery had vowed his side's performance was "going to be different" from their lacklustre display in Belarus and he was not wrong. The Gunners looked full of energy in the opening stages - winning two early corners and forcing a save from keeper Denis Scherbitski when Iwobi pounced on Lichtsteiner's cross. They were rewarded when the ball bounced off Volkov's shin and into the back of the net to give them a crucial equalising goal in the tie. Arsenal continued to press high up the pitch and created chances in both halves. They had 22 shots - including 15 in the box - and put in 24 crosses from open play. Xhaka forced Scherbitski into a smart save with a powerful long-range effort in the first half, while Mesut Ozil - making just his second start of 2019 and first in four games - poked a shot wide of the left post and Aubameyang's free-kick was saved after the break. Bate did come close on a few occasions - Skavysh got in behind Nacho Monreal only to slam the ball into the side-netting, before Dragun's header was kept out by Lichtsteiner. But Arsenal were dominant throughout and never really looked like conceding a costly away goal. The Gunners have not made the final of a European competition since their Champions League defeat by Barcelona in 2006, and were knocked out in the semi-finals of this competition last season. They will hope to go one step further this time around though - the prospect of securing an automatic spot in the Champions League by winning the Europa League is a strong motivator. The bookmakers have Arsenal down as third favourites behind Napoli and Chelsea to win a competition Emery won three times in successive seasons with former club Sevilla. Arsenal could come up against the Spanish five-time winners when the draw takes place on Friday. Arsenal manager Unai Emery speaking to BT Sport: "We wanted this result but also we wanted to play for our supporters here, to improve and build our mentality after the first match away, which was not good. We did our best to come back [in the tie] and the team worked very well. "But we also had to take precaution because if they scored they can be back in the match. Our message was if we score, carry on. If we scored two, carry on. Carry on and carry on. We needed two, three or four goals for more precaution in the 90 minutes. "The players did our game plan as we wanted and they arrived in the box a lot with a lot of crosses. And we showed the efficiency we went, which we didn't have away." Arsenal overturned a first leg defeat in a European two-legged tie for the first time since February 2010, when they knocked out Porto in the Champions League last 16. 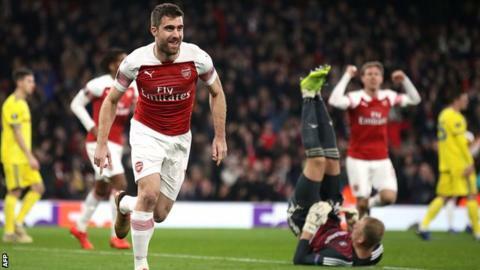 Arsenal have kept three consecutive clean sheets at the Emirates in European competition for the first time since a run of six shut-outs ending in April 2009 (including qualifiers). Including qualifiers, Belarusian sides have lost four of their five visits to English clubs in the UEFA Europa League; with Bate's win at Everton in December 2009 the sole success. Arsenal substitutes have scored 13 goals in all competitions this season, more than any other Premier League side. Emery has lost just one of his last 17 home games in the UEFA Europa League (W15, D1, L1), his Sevilla side losing 1-2 against Athletic Bilbao in the 2015-16 quarter final second leg. Arsenal's opener against Bate was their fastest in European competition since Lukas Podolski netted against Galatasaray (2 mins 1 sec) in the Champions League in December 2014. Seven of Mustafi's eight goals for Arsenal in all competitions have come via his head. Xhaka has provided two assists in a game for Arsenal for only the second time in all competitions, after setting up two goals against Leicester in the Premier League in August 2017. Ozil made his 19th appearance for Arsenal in all competitions this season, playing the full 90 minutes for only the seventh time in 2018-19. Match ends, Arsenal 3, BATE Borisov 0. Second Half ends, Arsenal 3, BATE Borisov 0. Stephan Lichtsteiner (Arsenal) wins a free kick on the right wing. Offside, BATE Borisov. Alyaksandr Hleb tries a through ball, but Bojan Dubajic is caught offside. Attempt missed. Slobodan Simovic (BATE Borisov) right footed shot from outside the box is close, but misses the top left corner. Assisted by Evgeni Berezkin. Attempt saved. Pierre-Emerick Aubameyang (Arsenal) right footed shot from outside the box is saved in the centre of the goal. Nacho Monreal (Arsenal) wins a free kick in the attacking half. Substitution, BATE Borisov. Bojan Dubajic replaces Maksim Skavysh. Attempt missed. Pierre-Emerick Aubameyang (Arsenal) right footed shot from the centre of the box is close, but misses to the left. Assisted by Henrikh Mkhitaryan with a through ball. Attempt missed. Mesut Özil (Arsenal) left footed shot from the centre of the box misses to the left. Assisted by Shkodran Mustafi with a headed pass following a corner. Substitution, BATE Borisov. Evgeni Berezkin replaces Stanislav Dragun. Igor Stasevich (BATE Borisov) wins a free kick in the defensive half. Goal! Arsenal 3, BATE Borisov 0. Sokratis (Arsenal) header from very close range to the centre of the goal. Assisted by Granit Xhaka with a cross following a corner. Corner, Arsenal. Conceded by Egor Filipenko. Substitution, BATE Borisov. Alyaksandr Hleb replaces Dmitri Baga. Attempt missed. Henrikh Mkhitaryan (Arsenal) header from the centre of the box is close, but misses to the right. Assisted by Alex Iwobi with a cross. Foul by Igor Stasevich (BATE Borisov). Substitution, Arsenal. Sokratis replaces Laurent Koscielny because of an injury. Foul by Maksim Skavysh (BATE Borisov). Attempt saved. Alex Iwobi (Arsenal) right footed shot from the left side of the box is saved in the centre of the goal. Assisted by Mesut Özil. Attempt saved. Maksim Skavysh (BATE Borisov) left footed shot from the centre of the box is saved in the bottom right corner.